Two years ago, Motorola’s Moto Z Play stood out for different reasons which include its battery life, efficient processor, and several other reasons. The Z Play was the kind of phone that cannot be resisted despite its few flaws. 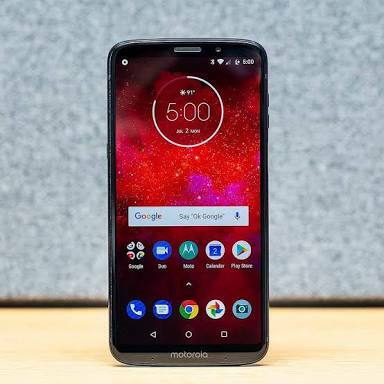 After about two years, the $499.99 Moto Z3 Play has lost almost its original, exciting features. The rate increased, and the battery life is far worse with has a midrange processor and a camera. The Z3 Play has been gussied up with a larger screen in the now-fashionable 18:9 aspect ratio, and it’s still compatible with all of the same mods that the first model could use. It’s sleeker than the original model, but the fingerprint sensor is in a less convenient spot, and the 3.5mm headphone jack doesn’t exist. Most of all, the Z3 Play, like many of Motorola’s mod-compatible phones outside of the original Z Play, feels like it solely exists to keep the Mod platform going and to provide a 2018 device that can use the existing Moto Mods. The slimmer design means the battery has a lower capacity, compelling you to use a Mod to extend its life and the speaker is especially intriguing. The Z3 Play is indeed more contemporary than its blocky predecessor, and the taller screen fits right in with the rest of the phones that are available now. It has a 6-inch display, 1080-pixel wide, an OLED panel. Its sub-7mm thickness makes it one of the thinnest phones you can buy, but it gives no chance for a good battery and a headphone jack. It also makes the Z3 Play awkward to handle when it doesn’t have a Mod attached. To make room for the larger screen while still maintaining the same overall size and shape as prior Z phones (that ensures compatibility with the Moto Mod platform), Motorola had to move the fingerprint scanner from the front of the phone to the side. Motorola has also upgraded the camera system to an in-fashion dual-lens shooter, which is capable of fake-blur portrait mode effects. The 12-megapixel camera is beautiful; it’s fast and can take good photos in the right lighting. But it’s not going to blow anyone away with its quality, especially as it struggles in lower light. It also applies for the 8 megapixels except that it requires proper lighting. The Z3 Play’s 3,000mAh battery is below average for this size of the phone. But to make up for this, Motorola includes a Moto Power Pack Mod in the box with the phone, which provides an additional 2,200mAh of battery capacity. The disadvantage is that it adds unnecessary weight to the phone. With the Power Pack Mod attached, the Z3 Play can last two or sometimes even three days between charges, but better battery life is still preferred. Motorola phones have a good history in software which is also imbibed In this z3. There are lots of exciting features, such as gestures for quickly launching the camera or flashlight or putting the phone in Do Not Disturb mode when you place it face-down. None of these features feel like bloat either. The primary OS is stock Android 8.1 Oreo. Most of the time, the Z3 Play is fast and responsive, but it struggled with choppy scrolling and laggy performance in some apps, such as Twitter and YouTube. That’s not something I’d expect from a $500 phone in 2018, and it’s certainly not a problem that similarly price phones, such as the OnePlus 6, have.